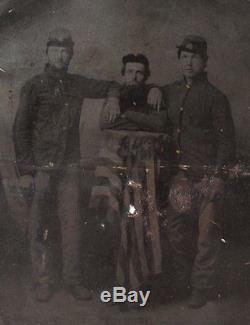 Very rare and original, 1860's Civil War Half Plate Tintype Photograph of three Union Soldiers gathered around a pedestal draped with an American Flag!! This outstanding, period Tintype Photograph measures approx. 4 1/8" by 5 3/8" and is not cased. The Tintype features a wonderful composition with three Union "Pards" pictured in full length with each wearing enlisted man's sack coats and kepis. The central soldier leans forward with his arms crossed and his elbows resting on a pedestal that has a large American Flag draped over it. His two buddies stand on each side of him resting their elbows on his shoulders. The composition is a wonderfully relaxed one and the presence of the large American Flag make this a rare Civil War Image. Unfortunately, the Tintype has not survived the years in particularly good condition. It is somewhat darkened overall and there is a small hole in the tin near the center of the American Flag. There is also a central, horizontal crease and some other shallow bends. There is an area of surface oxidation in the area of the thighs of the soldier on the right. The surface is stable and there is no active flaking or crazing. With all faults, this is still a charming and wonderful, large size Civil War Tintype and worthy of a professional restoration. A very rare and original, 1860's Civil War Half Plate Tintype Photograph of three Union Soldiers gathered around a pedestal draped with an American Flag and a fantastic addition to any collection! And Click Here to Add Us To Your Favorite Sellers List. Click Here to Discover More About this Item and Many Others on Our New Informational / Non-Commercial / Reference Blog - Walnutts. The item "1860's CIVIL WAR 1/2 PLATE TINTYPE PHOTO OF 3 UNION SOLDIERS with AMERICAN FLAG" is in sale since Friday, July 03, 2015. This item is in the category "Collectibles\Militaria\Civil War (1861-65)\Original Period Items\Photographs".